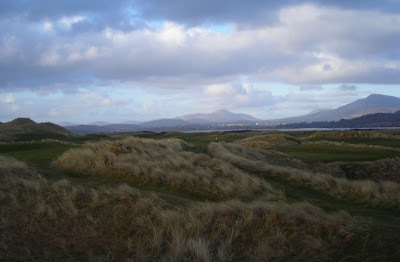 16th at Connemara, clubhouse on the left. Opened in 1973, following a golf course development story that could be made into a movie, Connemara Links is combining its 40th anniversary with The Gathering. 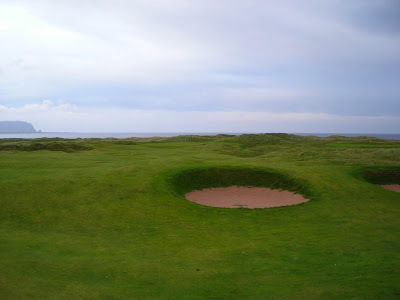 Eddie Hackett worked his magic over the linksland of Ballyconneely to create an intriguing 18 holes (now 27) that explode on the back 9 with some thrilling, even rocky, challenges. The front 9 plays more like a lunar landscape (I haven't been to the moon but I'm reliably informed that the topography is similar), with flat-looking fairways, open spaces and vicious bumps. And then there are the superb views across to the 12 Bens and out to sea. 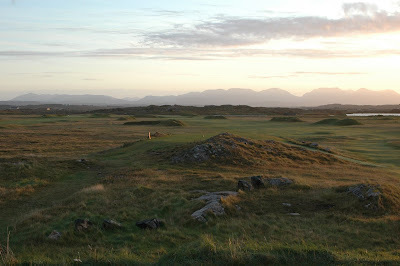 Connemara's 7th with the odd mounds flanking the fairways and (some of) the 12 Bens beyond. Sponsors: Mannin Bay Salmon and Golf Style Galway Ltd. Check out the golf club's website or Clifden Chamber of Commerce for starters - you'll find the best choice in the town of Clifden, a 15/20 minute drive from the golf course. 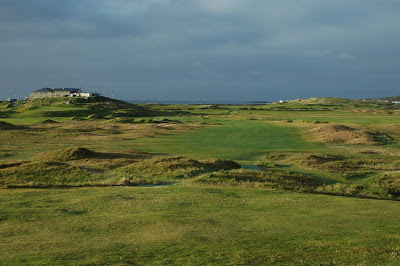 This is a four day event, playing over Rosapenna's two beautiful courses (Old Tom Morris and Sandy Hills) and Ballyliffin's two equally gorgeous courses (Old and Glashedy). 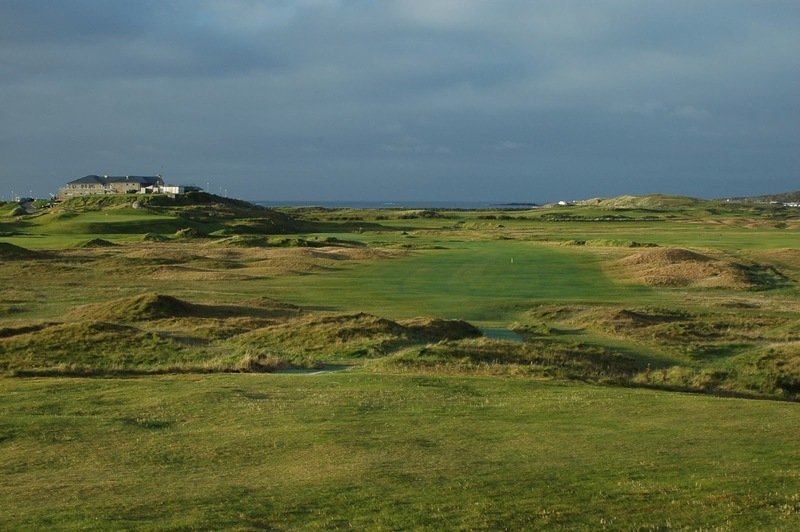 Unlike the Connemara event, this is an all-inclusive package, with five nights' accommodation at the very comfortable Rosapenna Golf Resort. 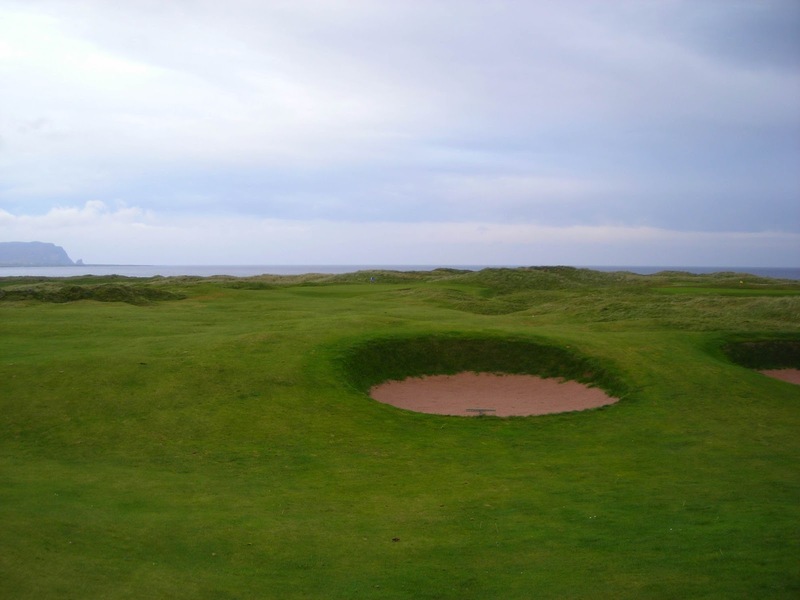 The names behind these courses include Old Tom Morris, Pat Ruddy and Nick Faldo, so it's an eclectic and venerable list that guarantees some remarkable links golf... some old and traditional, some new and full of muscle. You'll play all four and decide for yourself which ones thrill you most. The cost is $1,945 per person, and there are lots of extras involved. For the full details click here. This is a four-person stableford team event, with numerous prizes, goodie bags, shirts, dinner, car rental... and, importantly, the reward of becoming a Friend of the Golden Eagle Trust for one year. The Trust plays a vital role in the attempt to reintroduce Golden Eagles to this part of Ireland. It is a worthy cause. From Rosapenna to Ballyliffin is only 30 kilometres as the crow, sorry, eagle flies, but it's 95 kilometres by road... which is why organisers are paying special attention to the designated drivers. It's a clever touch, but the event in its entirety has been well put together... the question is: will the weather play ball? Keep a look out for other Gatherings and if there are any Irish Golf Gathering events that particularly catch your eye, let me know.